During a week when tentative peace talks are underway in war-scarred Afghanistan, a watchdog delivered another bleak assessment of U.S.-backed efforts to stabilize and rebuild that country, citing receding control of land, persistent corruption and greater expenses ahead. The assigned personnel strength of the Afghan National Defense and Security Forces as of Oct. 31, 2018, was 308,693—or 87.7 percent strength—a decline of 3,635 troops since last quarter and the lowest since the U.S.-NATO mission began in January 2015, said the report signed by SIGAR John Sopko. About 45,000 Afghan security personnel had been killed since September 2014, an average of roughly 849 personnel killed per month. This shrinking of influence came after U.S. Air Forces Central Command dropped 6,823 munitions in the first 11 months of 2018, a figure already 56 percent higher than the total number of munitions released in 2017 (4,361), and more than five times the 2016 total. 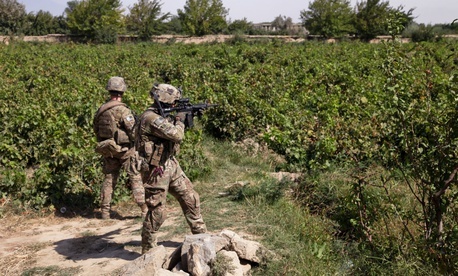 Both the Defense Department and NATO, however, stressed that the population control data are “not indicative of the effectiveness of the South Asia strategy or progress toward security and stability in Afghanistan,” citing uncertainty in the models. The Justice Department reported that the Afghan government has made insufficient progress to investigate and prosecute corruption cases. “The Afghan government has not yet demonstrated sufficient motivation or action to deter future corrupt actors, or to convince the Afghan people that the government is serious” about combating such crime, the report said. Only a “handful” of “B-Team criminals” have been prosecuted. “This corruption harms the battlefield effectiveness of the Afghan security forces by diverting resources meant for fighting units and creating negative perceptions of the Afghan government,” undermining its legitimacy and reconciliation efforts, said the Combined Security Transition Command-Afghanistan. Afghanistan’s centuries-old illegal narcotics trade remains active, and food insecurity is widespread, the report noted.